Get your plate in shape! For National Nutrition Month, the Academy of Nutrition and Dietetics offers this tip: Make seafood the protein on your plate twice a week. You’ll be on your way with this recipe for Kiss of Lemon fish tacos! March is National Nutrition Month and the Academy of Nutrition and Dietetics (the campaign sponsor) hopes to remind people about the importance of staying informed of healthy food choices and making good eating and exercise habits. What better time than spring to start new, positive habits? Work together with your family to accomplish your goals. The more your family works together to achieve the results, the better! Learn and have fun together! Check out some National Nutrition Month games, quizzes and videos with your family. 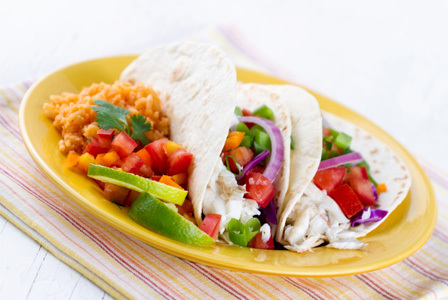 Then, enjoy a healthy, protein-filled meal with Kiss of Lemon fish tacos as the main dish! In a medium-sized bowl, combine the yogurt, lemon zest, juice from one lemon, honey, caraway seeds and pepper. Mix together until blended and smooth. Add the cabbage, mix well and set aside. Spray a broiler pan with nonstick cooking spray. Use the remaining lemon zest and the juice from one lemon to coat both sides of the fish. Add the fish to the pan and sprinkle with the chili powder. Broil the fish (set at about four inches from the broiler) for five to seven minutes on each side, or until cooked through (the fish should flake easily with a fork). Transfer to a plate or bowl and use a fork to shred the fish into large chunks. Warm your tortillas according to the package instructions. Add about 1/4 cup of the cabbage mixture into the center of each warmed tortilla. Divide the fish evenly among the tortillas. Top with cilantro and serve warm with a wedge of lemon. Fish tacos are a fun meal to make together and enjoy with your family. Fish as a source of protein is ideal for healthy eating habits!